The videos in this program sample movies or use sci-fi tropes to present alternate histories that address issues around rights, identities, displacement, and conflict. In A Space Exodus, Larissa Sansour (Denmark’s representative at the next Venice Biennale) becomes the first Palestinian on the moon, trying from space to re-establish communication with Jerusalem. Nation Estate, her Swiftian response to Middle East deadlock, offers a vertical solution to Palestinian statehood. In the Future… (screening for the first time in Canada) explores the use of archaeology as a political weapon. Siblings Dan and Dominique Angeloro, the two-person collective known as Soda_Jerk, describe Terror Nullius as “a political revenge fable which offers an un-writing of Australian national mythology.” “Exhilarating ... Terror Nullius is arthouse and grindhouse ... A crazy, punch-drunk, astral-projecting, bizarro roller-coaster ride through Australian cinema” (Luke Buckmaster, The Guardian). 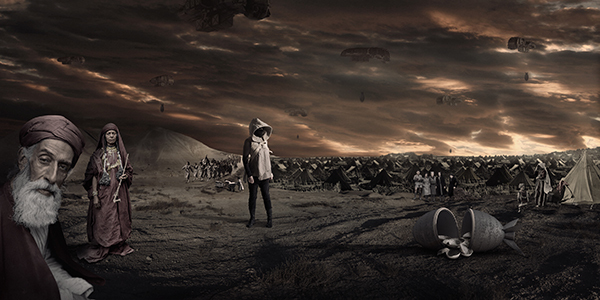 A Space Exodus | Larissa Sansour/Denmark 2009. 5 min. In the Future, They Ate From the Finest Porcelain | Larissa Sansour, Søren Lind/Great Britain 2016. 29 min. Nation Estate | Larissa Sansour/Denmark 2012. 9 min. Terror Nullius | Soda_Jerk/Australia 2018. 55 min. The screening will be introduced by Laura U. Marks, author of Hanan al-Cinema: Affections for the Moving Image (2015), who will speak about experimental and Arab science fiction.